HELLO AGAIN � it�s good to be back, though I�m still rather bemused. I�m sorry, but I can�t explain why the Flagship website went down in March, just after the copies of #131 came back from our printer. It was probably my fault, somehow, but I don�t know what went wrong. Maybe the problem arose because I mislaid my credit card folder so had to obtain a new card? I really don�t know how it happened. It took some time before I could contact our webmaster (his lap-top had broken) and, of course, no-one could email me to ask why Flagship was suddenly silent. If it�s any comfort, I�ve found this a horrible experience. I eventually registered for a second email address and send grateful thanks to Martin Helsdon and Thomas Harland, who arranged for me to post the PDF for issue #131 up on Thomas�s website. However, I didn�t realise quite how long it would take for the news of this to come out�in my simple fashion, I�d imagined that everything on the web is instant, but apparently it takes some weeks for Google to trawl through its various postings, so news of the PDF wasn�t immediate. Fortunately, I should now be able to offer an alternative to the old website. Paul Goldstone helped to lay out #130 and advise about finding a new printer, Mica Goldstone from KJC Games has offered us an independent section of their website. My gratitude to all! We won�t be owned by KJC, but will remain our own masters and your facility. I�ll just add that it is taking time to restore the site and gather the material for #131, but I hope to see everything up and running in due course. Many thanks to all who�ve sent support and encouragement. 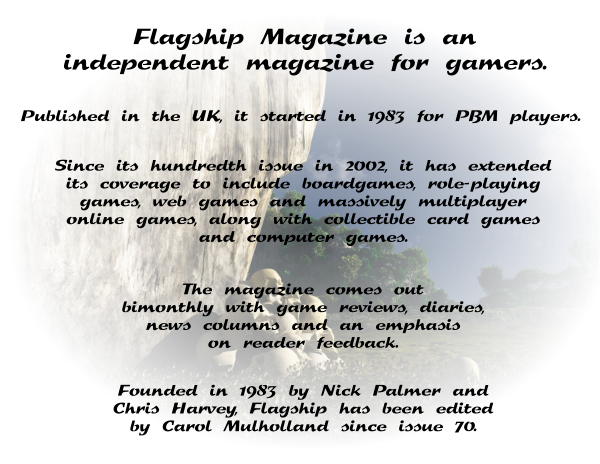 Remember, Flagship�s aim is to provide a forum for games players and we always aim to mirror your points of view. While I�m on this subject, I feel myself that we�d benefit from more regular coverage of RPG games now that Robert Rees has resigned. Is anyone keen to supply such material? Just get in touch with me, if so. Copyright © 2007-2011 Skeletal Software Ltd. - All rights reserved.